Based upon years of clinical use, Kinesiology tape is specifically applied to the patient based upon their needs after evaluation. The findings of the clinical evaluation or assessment dictate the specifics of the kinesiology tape application and other possible treatments or modalities. 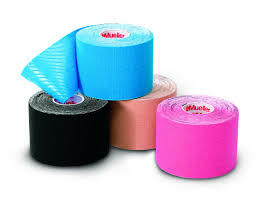 With the utilization of single “I” strips or modifications in the shape of an “X”, “Y” or other specialized shapes as well as the direction and amount of stretch placed on the tape at time of application, Kinesiology tape can be applied in hundreds of ways and can re-educate the neuromuscular system, reduce pain and inflammation, optimize performance, prevent injury and promote good circulation and healing, and assist in returning the body to homeostasis.